Playing music to an audience, whether it's a stadium rock band or a CD at a kid's birthday party, will involve some fundamental principles of audio production. Basic knowledge of the factors affecting live sound can help DJs avoid common pitfalls and maintain audio quality across venues. As the front line 'face' of what's being heard, it's in the DJ's best interest to be able to diagnose and minimize problems with the sound system, or at least the part which he or she is directly in control of. 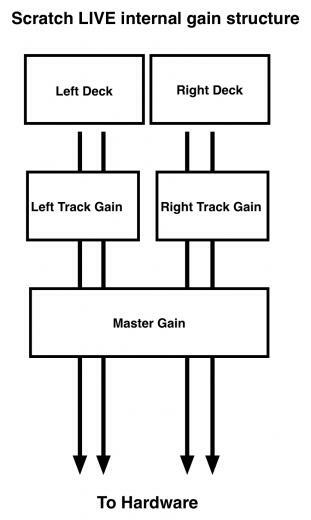 This article is intended as an introduction to the key concepts of gain structure and audio theory, with specific bearing on equipment commonly used by DJs. Good gain structure is essential for a good sounding system, with adequate level. Systems that have large amounts of noise are almost invariably due to poor gain structuring. 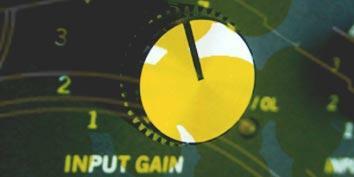 Gain is the process of increasing the amplitude of your signal, or 'making it louder'. The reverse process, making your signal quieter, is known as attenuation. Headroom, as the name implies, is how much room there is between the average level of your signal and the 'ceiling' - the maximum allowable level in a given part of your system. Clipping describes what happens to a signal when it's amplitude is greater than the system will allow. Clipping can result in unpleasant loud distortion. Noise is technically any unwanted portion of your signal. Generally in DJing, it will be hiss, hum, or perhaps crosstalk interference from other signals. An analog audio signal will always accumulate some noise during transmission, and minimising how much is best achieved by keeping the signal as loud (hot) as possible while also avoiding clipping. Signal to noise ratio (SNR) is the measure of how hot or high the desired audio signal is above the noise floor of the system or piece of equipment. Higher ratios meaning less background noise. Poor gain structuring is almost always the cause of excessive noise in a system. The noise portion of your signal will be affected by gain in the same way as the rest, therefore it is less desirable for a quiet signal to be transmitted than a loud one, if possible, while avoiding clipping. For example a turntable phono output is very low level, and if transmitted for more than a couple of meters via standard cables, will accumulate a large amount of noise proportional to the material content. When that signal is later turned up to line level by a phono pre-amp, the result will be very noisy. Note the relevance of this to the SL 1 Thru outputs, if you use normal vinyl in your setup. Try to use the shortest cables you can from the SL 1 to the mixer phono inputs. Below is a diagram showing the basic signal flow in a typical setup, with the likely points to apply gain highlighted. The ideal is to limit the points in a system at which gain or attenuation is applied to two; One gain at the input, and one attenuation before the power amplification. This minimizes the possibility of poor signal to noise ratio in your system. Meters tell you the level of your audio, usually the color red indicates clipping, or that you're approaching clipping. In Serato DJ there are two meters, one for each deck. There are also three gain controls, one for each deck individually as well as one master gain affecting both sets of outputs equally. They indicate the level of each output just before the signal is sent to your hardware. If the meters are sitting just below the red, your signal is as loud as it can be without clipping. This is generally what you will want. Each audio file in your library can have a gain value associated with it. If you have files which are too quiet, or too loud, you can correct this using the track gain knob in Serato DJ, and that setting will be saved into the gain tag. In Serato DJ we have an Auto Gain feature, which does this step automatically. Check it out in the manual. If your tracks peak just under maximum level, the master gain in Serato DJ should remain at 12'oclock. Do not be tempted to crank the master gain "into the red" to get some more level into your mixer; all you will be doing is clipping your audio, distorting the music before it even exits your computer. It should be noted that the track and master gains inside Serato DJ make up a single overall SSL gain (or attenuation) value for each deck's output. So in practice you should set your master gain so most of the tracks in your library are just below clipping on the meters, and then adjust individual tracks as needed to bring them to the right level. In the signal flow diagram, you can see some other sources coming into the mixer, normal vinyl from a turntable, and CDs. Your input gains on the mixer are a good place to even up different sources. Use the input gains in conjunction with the meters on your mixer to make sure the loudest track you will play doesn't clip the mixer at all. As usual, get it into the yellow or orange, not the red. With correctly set input gains and master output on your mixer, the channel faders should purely be a tool to add dynamics to your performance, and aid in smoothly transitioning between tracks. You should be able to have your track faders all the way up without distorting or going into the red on your mixer's output meters. Even though it's being mentioned last, you should try and set the mixer master output gain first thing when you're setting up, or during sound check.